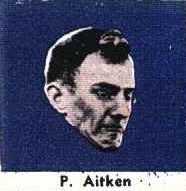 Peter Aitken. 19 -year-old Kyabram rover, has been signed by Carlton. He played well in this season's Goulburn Valley Football League finals. The Argus 28 March 1955, reporting on Carlton's practice match said; "Aitken was liked to Essendon star Bill Hutchison in his movements, and he, too, looked likely to have a future in senior football." Peter was a postal worker, The Argus March 30 1955 reported that he had been transferred to the Carlton Post Office. Aitken played 11 games for the Blues in Season 1955, kicking 7 goals. He came from Kyabram. The Argus April 18 said of his debut; "AITKEN: Clever ball handler, safe mark, and accurate kick. Very fast. A great acquisition for the Blues." Contributors to this page: blueycarlton , molsey , Bombasheldon , p(12)terg , timmyd , Jarusa , WillowBlue , keogh , true_blue24 , Juzz and admin . Page last modified on Tuesday 19 of March, 2019 13:47:23 AEDT by blueycarlton. 1987 - Peter Bosustow wont be returning to the Blues (15/04/87). 1991 - Parkin wont be the scapegoat for the poor season (11/09/91).